There was, in fact, no way to sugar-coat the Saints’ team-wide implosion from the charity stripe as B.C.’s No. 8-ranked Quad-A team combined to miss 14 free throws over a dramatic second half at the Dragon’s Lair against its arch-rivals, the No. 3-ranked Vancouver College Fighting Irish. Yet despite their egregious ways, the Saints banked just enough basketball karma over a dynamic first half to top the Irish 70-65 and stake a claim to what should be a top three seed at the upcoming Lower Mainland championships. 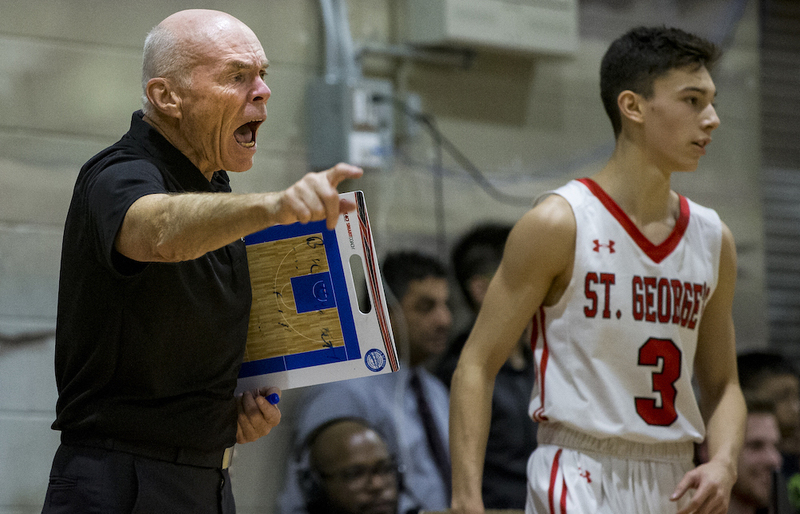 “We’ve been a good free-throw shooting team all year, but sometimes when you miss a few, free throws have a way of getting into kids’ heads,” said a relieved St. George’s head coach Bill Disbrow, whose team had lost the first game of the home-and-home Independent League set 90-89 at Vancouver College back on Jan. 22 and was riding a season-high three-game losing streak. The Irish trailed by as many as 21 points (47-26) after giving up the opening basket of the second half, yet as they showed last month at Terry Fox’s Legal Beagle invitational, rallying from a 64-39 deficit midway through the third quarter to beat Kitsilano 75-72, they never count themselves out. Despite playing without an injured Callum Chow-White, and losing both forward Toni Maric and guard Jason Soriano to fouls over the final six minutes, Vancouver College came roaring back, parlaying the slew of missed Saints’ free throws with gutsy play from Grade 11 guard Josh Lum-Tong. The Irish cut the deficit to 10 points (57-47) heading into the fourth quarter and three times pulled to within three points of St. George’s. Lum-Tong’s three-point play from the stripe made it 64-61 with 4:38 left, his two made free throw made it 66-63 with 2:44 left, and his driving lay-in through contact with 41 seconds left made it 68-65. St. George’s Jaxon Cohee, who had earlier struggled from the stripe, was huge down over the final 90 seconds with a lay-up, and later, two made free throws, snapping a string of six straight Saints’ misses in the quarter, to ice the game at 70-65 with 2.7 seconds remaining. Saints got tremendous play from point guard Jerric Palma, who scored 20 of his game-high 25 points in the first half. Palma, getting back on the floor after having to sit out in losses to Burnaby South and Kitsilano, is surely as valuable as any single player in the province is to his team. Palma hurt his ankle early in the first meeting with Vancouver College and was having trouble walking. He begged his way back into the game and despite the one-point loss, scored 31 points that night. 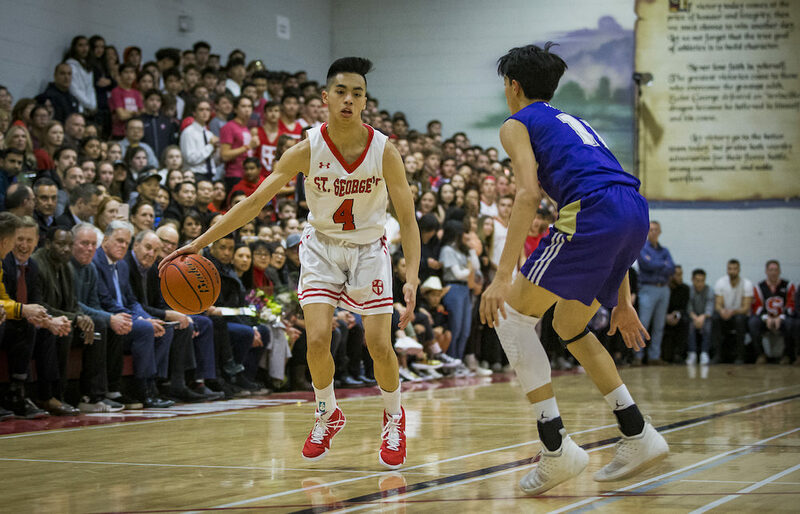 Wednesday’s game was his first since as the Saints struggled without him, losing 77-69 to Burnaby South and 91-61 to Kitsilano. Ao Ma added 10 for the Saints while Cohee added six. Lum-Tong led Vancouver College with 21 points, Luc Therrien scored 17 points, while Maric added 10 points and Sean Heppner eight.